This entry was posted in Comments about Cycling on March 6, 2014 by Steve Tilford. I saw a couple photos from the 1st NORBA Nationals, outside Santa Barbara, on Facebook a couple days ago. Gene Maruszewski posted them on his Facebook page and tagged me. There aren’t that many photos around from that race. At least, not many photos that have been downloaded/turned digital. I don’t really remember many spectators at the race. The conditions weren’t conducive for cameras. It was raining cats and dogs. It was just Roy Knickman and myself from the Raleigh Team. Kent Eriksen, who owns Moots, built us a couple bikes the week before and Alexi Grewal flew them out to us. He ended up wearing our jersey too for the race. I think I was fortunate winning the race. It could have gone any which way. 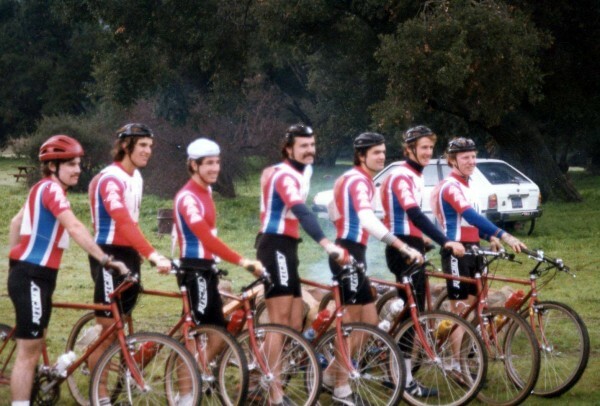 Anyway, I guess I realized that all the guys in the photo below, rode the race, but didn’t really know that they were all riding for Tom Ritchey. That was a pretty stellar line-up. Pretty great photo. Ritchey Team photo before the race. Joe Murray, Eric Heiden, Dave McLaughlin, Tom Ritchey, David Zanotti, Dale Stetina and Sterling McBride. There were lots of stream crossings. I don’t think I’ve ever since raced in long tights and a short sleeve jersey. A wool short sleeve jersey no less. Alexi’s skinny legs at the start, along with his camo Moots bicycle. Love the old bikes! That Moots w/the biplane fork crown and camo is something. Makes me wonder where TR got the idea for his famous Commando model! Love the matching framepump. And just in case things get outta hand the mech beside the bike has another one. Prepared like a good boyscout! Yes, Alexi rode the Dura Ace AX pedals then. They were the best road pedals on the market then, as they allowed a few extra degrees of corner clearance. 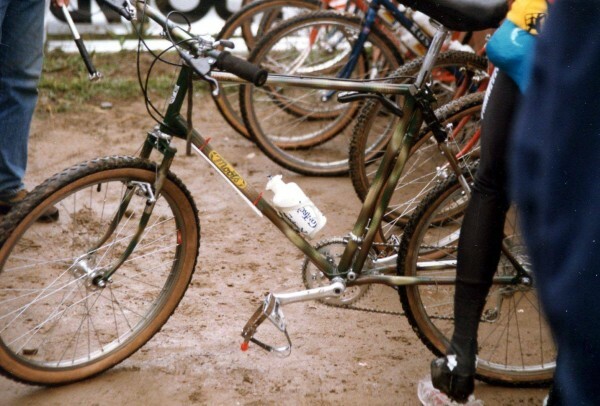 Man, I almost forgot that MTBs had no rockshox on the forks then. Your forearms and hands must have taken a real beating then. I was admiring the toe clips in the last picture. I remember and despised those things. Once I went clipless I never looked back. Yeah, more riders than spectators by a long shot that day. Those of us who were good at wallowing in the mud did better than the rest. I think Heiden and that group beat me to the top of the hill by 3-5 minutes the first lap. I passed a group of 4 of them getting squirrelly on the slippery tight single track only maybe 1/2 mile down from the top. Roy was amazing that day. He was in second at the start of the second lap and rode an entire lap of the course with a flat (two flats?) before I overtook him for third. Riding no suspension wasn’t and still isn’t that hard on your body. You experience about the same amount of shock, just at slower speeds. What year was this, 1982? Is that guy (in the shot with Steve) wearing a Skid Lid?